4pyre² is a 12 ft pipe with propane burners on each end. When the burners fire, the pipe is propelled around on two axes, tracing out the surface of a 12 ft diameter sphere. Enabling this pipe to spin is a gleaming machine of aluminum, stainless steel, bearings, shafts, hoses, rotary fluid unions, sprockets, chains, motors, encoders, and microcontrollers. Standing nearly 18 ft tall, it holds the sphere of fire high enough that visitors can get quite close. There is also a panel where visitors can control the angle and the thrust of the propane burners, creating different patterns through the sphere. The piece will operate every night from darkness till around midnight. The Aeolian Pyrophonic Hall and Whispering Wall conjures the millions of things that are happening within the metropolis at any given time. A sound installation incorporating a wind harp, fire organ, and the voices of the citizens of Black Rock City, the hall envelops citizens in dappled sunlight during the daytime, shadowy effects at night and surrounds them with sounds evocative of the desert and the Burn. Nightly performances of the fire organ with dancers, stilters and musicians will take place after dark. Caged Pulse Jets is an interactive, kinetic sound sculpture. The caged birds are five spinning pulse jet engines of various sizes that create a range of percussive and droning tones. Through a completely interactive interface, the public can create sound compositions ranging from the symphonic to the cacophonous while they are held captive by the fiery jets spinning by their own thrust. City Lights Project will bring illuminated art to the dark, back streets of Burning Man. On the playa, the corner sign posts identify the roads and pedestrian walkways. These utilitarian sign posts are useful in navigating the city by day. At night these Sign posts are a hazard for being unlighted. By installing unique solar-powered light sculptures on the sign posts. We will make them distinctive artistic landmarks and will illuminate them during the night. The City Lights Project will provide artists from around the world a basic solar light fixture. They will then transform it into their own light sculpture. The Crossroads is a community gathering space. Six blacksmithed, scroll-work columns (a la Iron Monkeys) encircle a 10′ stainless steel fountain flowing with both fire and water. Inside the circle of columns a courtyard awaits. Benches and a sculpture gallery invite the participant to look and linger, inspiring a public place to rest and recharge during the journey from place to place. The Crossroads is also a curated sculpture gallery, providing cultural real estate for some of the playa’s often overlooked sculptures. A 40ft tall diamond shaped tower of dynamic light effects. Doctor Megavolt is a performance piece where a man in a metal suit interacts with 15 foot long bolts of artificial lightning. Back by popular demand for his 7th Burning Man appearance, Megavolt is legendary on the playa. The show involves authentic stunt work that is inherently dangerous and very real – it is an antidote for the continued march towards a simulated world of CGI effects and virtual reality. The Dragon Smelter is an 18 foot high steel sculpture with a crucible built into it’s belly. We will take this creature out to the desert, fire it up and use recycled aluminum cans to create original sculptures right there on the playa. Citizens of Black Rock city will be encouraged to participate in the process of creating these sculptures. This year we will also be creating “Karma coins” in a smaller smelter for participants. The coins can be used for barter, or worn as souvenirs. Beneath a giant sledge hammer, moving industrial images of frantic workers are visible through skylights on the ground, suggesting the enormous power turbines underneath the city need a “bump start”. Infinity mirror tunnels, whirling roof vents and a submerging conveyor belt further the illusion. Three regular-sized sledgehammers are the tools for interaction. When a participant slams one down on their target, a deep, audible “boom” shakes the ground, feet, ankles, etc. The more simultaneously the three hammers are struck, the higher the tongues of flame travel up the giant hammer itself. If the three participants get the flames all the way to the top, the hammerhead spins with liquid fire, unfolds, and reflects shafts of light downward like an infernal disco ball as the underground turbines audibly groan up to speed. Strength and accuracy matter not– it’s all in the timing. Ein Hammer is a tribute to workers as one. A voice-reactive audio-visual laser-blastin’ phone booth experience. Excellent Adventure honors the phone booth as a metropolitan icon, and explores its potential as a sensory experience askew from our expectations of its form. The two booths of Excellent Adventure use focused beams of visible light to transmit voice data from one to the other, and inbuilt dynamic lighting to pulse and fade through the spectrum in response to the tone and volume of the call being received. In this way the booths quite literally “color” conversation, divorcing the experience of telephonics from awkward, one-dimensional expectations. Interactions with Excellent Adventure remind participants that the spectacle and miracle of the metropolis is squarely rooted in our ability to connect with each other. Crossing through the cacophony of progress in our shining desert Metropolis, we waver and stop to witness a modern utopic vision surrender to a dystopic fate. A monument to man’s technological advancement has been mysteriously abandoned to time and left to seed. In its place, a monument to nature grows out of its fertile ground. The angular black steel roots of modern computer circuitry in the shape of a stepped pyramid give way to the ancient roots of a sacred Bodhi tree. This flowing root system reclaims this relic of our Future’s Past in its embrace, and signals the end of consumptive collapse and the beginning of evolved consciousness. From dawn till dusk come visit the Ghost Train and create your own digital graffiti. Throughout the festival a projection of a life-sized train slowly moves across the playa creating an infinite train-car canvas for participants to digitally paint with modified spray cans. As participants paint the projected train their work not only appears to move with the train but also reappears randomly on future trains throughout the event. All the way from Sweden comes The Grand Flat Piano, a 22 meter (72′) long flat piano. It has 61 keys in 5 octaves. Each key is connected to a key on a synthesizer which plays the sound through a amplifier and loud speakers. The Grand Flat Piano can be played by anyone, so just come out on the playa and play on the largest piano you have ever seen. If you want a whole jam session just bring your own instruments and jam along The Grand Flat Piano. The Hindenburk is a classic wooden framed airship mounted on a mobile platform that aims to reinvigorate a delightful association with airship travel by bringing it back to a playful place. Shaped in the form of prewar dirigibles, the sculpture points to a time when scientific progress was unaided by the technological advancement of computers and man-made materials and was undaunted by implications of war. The Hindenburk has the ability to inspire the collective unconscious as a symbol of early airship travel when it was a point of thrilling progress, capable of being accomplished with merely natural materials and a good dose of guts. Maps are the universal medium for communication, easily understood and appreciated in all languages and cultures. Every culture in the world uses and makes maps in some form or another. They have evolved from Babylonian clay tablets to satellite imagery visible to anyone access to the internet. It is this present technology that makes possible my effort to create dense and complex textured surface designs that incorporate city maps from around the world – from heavily structured grid formations of planned cities to the medina’s of Fez. All these woven into one another to create a dense compacted moment and place in time like any good map would do. “infinitarium” is an organic environment that is highly interactive as it engages people on many levels. The scale of this playful garden is exaggerated, making visitors feel part of the landscape, yet humbled by nature as it looms large above them. It is a destination for people to interact with each other and the art, and contemplate the role reversal of nature being larger than human-kind. The installation is made of salvage and scrap materials, keeping it’s environmental footprint to a minimum. This aspect supports the message of the sculpture; that we are small parts of a larger entity. The components of the sculpture include water fountains, fire fountains and unique solar-powered lighting effects. The installation occupies approximately an acre. From a distance, the installation appears to be an unusual and enchanting landscape. As people draw closer to the site, the over-size scale, the elaborate details and the smaller components captivate viewers. Once they have entered the installation, visitors are enveloped by this natural, enormous environment. At a busy intersection, figures wait patiently to cross the street. Paying little attention to one another, their minds are instead occupied with thoughts of daily responsibilities, to-do lists, frustrations, and fleeting revelations. Enveloped in the unceasing noise of the city, they view their surroundings, including one another, as obstacles that must be avoided in order to tend to their busy schedules. Potential connections are passed up as judgments are quickly formed and opportunities are overlooked entirely. “Intersection” provides these disconnected pedestrians with the chance to peek into the lives of one another and to discover that there is more in common than the surface would suggest. The Kinetic Cab Company will bring a new sense of freedom and whimsy to the Burning Man event in 2010. Participation is key to this cab company where the “fare” is collected in human power. During daylight hours they will offer rides around the Black Rock metropolis. Several Kinetic Cabs host art tours and deep playa journeys. Tours will depart the KCC regularly. They will post “Kinetic Cab Stop”s around the playa to pick burners up for pedal powered rides in delightful machines. The cab stops will be be an interestingly unique feature of Burning Man 2010, “Metropolis”, moving people through pedal powered energy. In 2010 we want to revisit the Keyhole entrance to Center Camp using the same method of collaborating artists working individually as a team project. This year we want to bring the art down to eye level. Allow passer-byes to play with the sculptures. Allow them to add color, to draw and write onto the sculptures. Wood, cardboard and paper will be used to create all the light sculptures. A rainbow of markers and pens will be attached to each installation. Passer-bys can use these tools to supply their own contribution. Malvoye the Mentalist: A fully automated antique fortune telling booth, shares versions and visions of the future. Nightly, Malvoye’s powers of mentalism are summoned to give you your own very unique and astonishingly accurate fortune. Malvoye knows all, Malvoye sees all. Each and every reading gives YOU the chance to ask Malvoye your own personal question. An homage to Earth’s first metropolis, the Mant Farm provides the Playa with a dramatic, immersive, interactive vertical maze where you can explore the concepts of maturation, citizenship, nostalgia, scale, and systems of communities – in a working ant farm built to human scale. Minaret is a 50′ tower that can be scaled externally to the midpoint, then entered into and climbed to the top. A latticed stainless steel dome on top allows people to see out without danger of falling.The tower is in 6 sections. The bottom 3 are based on the vertebra of a lion.Steel and redwood will be combined to form a climbable structure.The upper 3 sections are painted to resemble snake skin and are smooth on the exterior to discourage people climbing externally.An interior access portal allows people to climb up to the dome.Light and sound effects will enhance the experience, especially when climbing internally. The Nowhere2Nowhere monorail is a public transit system with an elegant art deco design. The monorail consists of two stations with a 500′ track in between, each station consists of an 8′ high raised platform for boarding the monorail and a ticket booth. The monorail car seats two people and efficiently transports the rider from Nowhere to Nowhere. a circle of flames created from numerous smaller circles of flames- symbolizing the nucleus, center of all things. A do-it-yourself cityscape sculpture installation, Polygonia is a fully interactive art project that mirrors the art theme of Burning Man 2010 — Metropolis: The Life of Cities. Hundreds of large, colorful interlocking polygons and connectors are used to form functional, whimsical, fantastical structures or sculptures, limited only by the imaginations of the participants. Build, tear down, build anew — a metaphor for the dynamic cycle of real cities. And then, in the end… burn it all down. Fire burning on water is absolutely hypnotizing. The ability to allow a participant to pick up water and flame to allow it to burn in their hand is amazing and safe. This piece gives people an opportunity to safely hold a flame in their hands for a very brief time. In that moment they share a time and place with fire in a way they may never forget. From the Axum Obelisk to the new Burj Khalifa sky scraper in Dubia, towers are built to draw attention. Using shape, texture, materials, and light, towers attract people from afar to serve as a space for assembly. The Spire of Fire, a 48-ft blend of steel, fire, and light, will stand grand and high on the expanse of the open playa and is designed to reflect the evolution of modern metropolitan architecture. 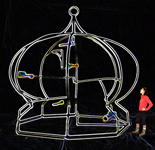 Its sheer size and presence will capture attention, and at night the piece will come alive with brightly colored lights and bursts of rhythmic flame reflected off of stainless steel. The STONE OF ROME is a large, glowing, ancient, sun-disk face. It will ask you to put your hand deep into it’s gaping mouth and then tell a lie. It will judge your lie. What will it do, what will it say? Nobody knows… except the STONE OF ROME. Within chaotic urban environments, we seek mental isolation as a coping mechanism. Through isolation we can escape from the tension of surroundings to an internalized space of freedom. As we revisit this space over time, our mental barriers grow stronger in an attempt to preserve this internal place of serenity. Subway is an interactive audio installation that examines this isolation, juxtaposing the dynamic sounds of a New York subway station with the vast, unconstrained desert. Syzygryd is a town square for the collaborative creation of music. It’s a public space, it’s a sculpture, and it’s a musical instrument. It’s the most beautiful expression we can imagine of the joy we take in community, music, technology, fire, sculpture and architecture. Humans have always made music together with whatever instruments they had. Bones became flutes, hides became drums. A hundred years ago the symphony orchestra was the pinnacle of musical collaboration. Then came the electric guitar and the four-piece band. Our community today, our city in the desert, is inextricably linked with the rise of electronic music, but it’s no longer enough to have crowds cheering for the performer. Dancing together is good stuff, but we’re not so keen on the concept of an audience. It’s time our interactive metropolis had an interactive concert hall. The Temple of Flux stands not as a habitable building, echoing churches and mosques from our histories, but as a counter-monument. Referencing our impetus to create structure as well as to relate to our environment. The Temple of Flux welcomes participants to take respite. It beckons one to journey its pathways and follow its sensuous lines as they arc into the air. From a distance, Tiny Tropolis appears as a row of standard cardboard boxes that have been secured, one after another, upon a wooden structure stretching out on the playa. The heart of Tiny Tropolis lies within, and passersby will need to get in close to experience the richness of this installation. Each cardboard box contains a diorama constructed by a different individual in tribute to the potential of expression for each of our internal creative realities. Like the housing projects of Staten Island that brought together many of the artists that eventually composed the Wu-Tang Clan, Tiny Tropolis exposes the multitude of expressive beings living on top of and among one another in our nation’s cities. Tiny Tropolis has a philosophical and literal objective to build artistic community on the playa. It is truly community-based- a collective project that funnels the artistic spirit of people across the country into the most celebratory- albeit tiny- block party to hit the playa yet. UnNatural Selection is an interactive “exquisite corpse” concept realized as a large, octagonal, artwork that rotates to form 512 possible combinations. It is set in a sculptural kiosk-like structure that allows people to play with it by turning cranks to control the position of each segment of art thus creating new creatures/characters with every turn. UnNatural Selection is a subtle way of illustrating mankind’s increasing influence on natural processes but it’s mostly just for fun. Zark is a journey from the wide-open empty spaces of the playa into an intimate miniature hidden world. Zark appears to be a huge caterpillar at a distance, glowing in the darkness. Inside this organic architecture, participants will find and incongruous and ancient miniature ruin of playa mud brick buildings. This ancient tiny lost civilization harbors an amazing secret hidden below the surface.